Sergej Eisenstein’s film was produced around the 20th anniversary of the Odessa mutiny. Russia in 1905. The Russian-Japanese war can be felt in the harbour town of Odessa on the Black Sea. In the army and navy, discipline is enforced with drastic measures. 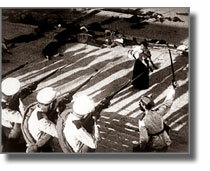 Among the sailors of the Battleship Potemkin, general animosity because of rotten supplies turns to mutiny. Eisenstein’s masterpiece polarized the Weimar Republic unlike any other film. Amongst great public interest, German censors scrutinized, approved and banned the film, which was later named as the “best film ever made” by international critics at Brussels’s World Fair in 1958. Caligari: 26.04. / 10 a.m.